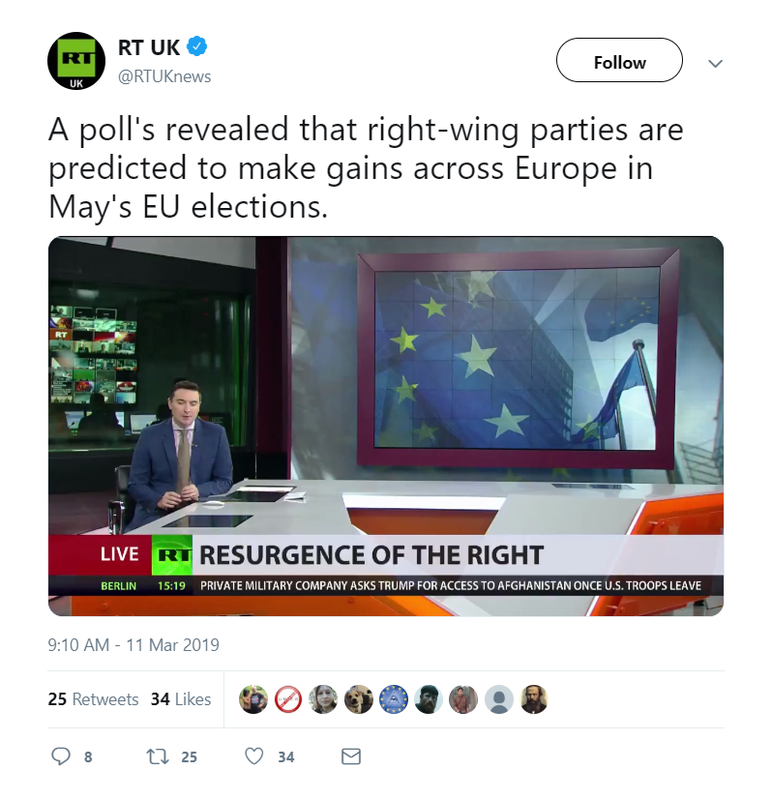 Russia Today (RT) UK posted a video on Twitter on March 11th 2019 about a rising of right-wing parties in Europe. We believe the claim to be mostly true. The poll was first reported on by Bild on March 8th. The survey supposedly reveals that right-wing parties in Europe will double their seats in the upcoming European Union elections. Over 9,000 people would have participated in the survey, according to Deutsche Welle, Germany’s international broadcaster. The poll was partly carried out by the Institut für Neue Soziale Antworten (INSA). It revealed a number of charts on March 12th 2019 related to the poll. Together with other polling institutes from several countries it worked together to collect and share data about sentiment in European countries. The other countries are Italy, Spain, Poland and France. The charts show the results of the survey per country. INSA updates the charts weekly by doing a questioning every Sunday. And that is not all. After the revelation of this survey, there were many different sources who also published about it. The Guardian, Reuters and Politico are a few of them. And they all write about the same thing: the right-wing will have a large gain in Europe. INSA shows that in France the party Front National (FN) alone will be coming out the strongest with 23% in the elections. Deutsche Welle illustrates in their article that Europe of Nations and Freedom Group (ENF) is anticipated to be winning 67 seats and that they currently hold 37 seats. With a difference of 30 seats, and a half of 34 seats, it is almost doubled (from 37 to 67). These numbers from INSA and Deutsche Welle do confirm the claim that right-wing parties will double its seats. A monthly report from Eurobarometer, which collects and combines available national polls in Europe, have findings of their own. They as well have conducted surveys. The procedure of collecting all the data of the voting intention surveys has been done in a careful manner. Kantar Public, their national partners and the EP Liaison Offices (offices spread throughout the Member States such as Ireland, Belgium, Portugal and many more) select the surveys and also collect them. The Public Opinion Monitoring Unit is the one to approve the final selection of the surveys. The total survey was conducted by face-to-face meetings with 27,901 EU citizens in the 28 member states. The results have been elaborated in an Excel-file. This file includes the outcomes of every country in Europe. Eurobarometer came up with a 40% rise of the ENF, which apparently comes very near to the doubling. This also matches the article of the Deutsche Welle. Now, taking into account the multiple articles that reported about this surge and looking at the numbers of both INSA, Deutsche Welle and the Eurobarometer, the claim is mostly true. Right-wing parties will be rising in Europe. But of course the true result will come out after May 26th 2019.